Orioles are beautiful and distinctive birds, but they are only instantly recognizable if the region is home to a single oriole species. Many orioles look similar, and it can be more challenging to tell them apart in regions that are native to several of these colorful birds. Learning how to properly identify orioles is essential for birders to feel confident in identifying every oriole they see. Optics: Birding binoculars should have a strong magnification and proper lens coatings for the best color clarity and detail resolution. This will help distinguish subtle details between different oriole species. Wide lenses will also capture greater amounts of light, which is essential in the forest habitats and dappled shade orioles prefer. Field Guide: A thorough field guide will help identify orioles by including detailed range maps for each species, as well as either illustrations or photos of different ages and genders. Female orioles, in particular, can look extraordinarily similar, and detailed descriptions and images can help show their subtle differences. Camera: A camera with a good zoom and fast shutter speed will help capture clear, detailed oriole photos that can be examined more carefully later on to confirm bird identifications. This can be very useful when the birds are active and do not always present clear views for long periods. Oranges and Jelly: While foods won't help identify orioles directly, these sweet treats will attract orioles to backyard feeders. The more frequently they visit, the more likely it is that birders will have good opportunities for exceptional views and accurate identifications. Size: How large is the bird overall? How does its size compare to nearby fence posts, tree branches or other features that can help confirm exact measurements? Color: How much black is part of the bird's plumage? Is it more orange or more yellow? Are there any brownish or greenish washes on the females? How bright is the coloration? Bill Shape: How thick is the base of the bill? Is the bill thin or thick overall? Is it straight or decurved toward the tip? Hood: Does the bird have a dark hood? How extensive is the hood? Does it cover the nape, chin or upper breast? If the bird does not have a full hood, are there other dark markings on the chin, throat or lores? Wings: How large is the white patch in the bird's wings? Does it lack a patch? How prominent are any wing bars? What color are the scapulars? Mantle: What color is the bird's mantle? Is it black or another solid color? Does it show any streaking? Underparts: Are the underparts one uniform color or do they have multiple colors? Are there any spots or streaks? 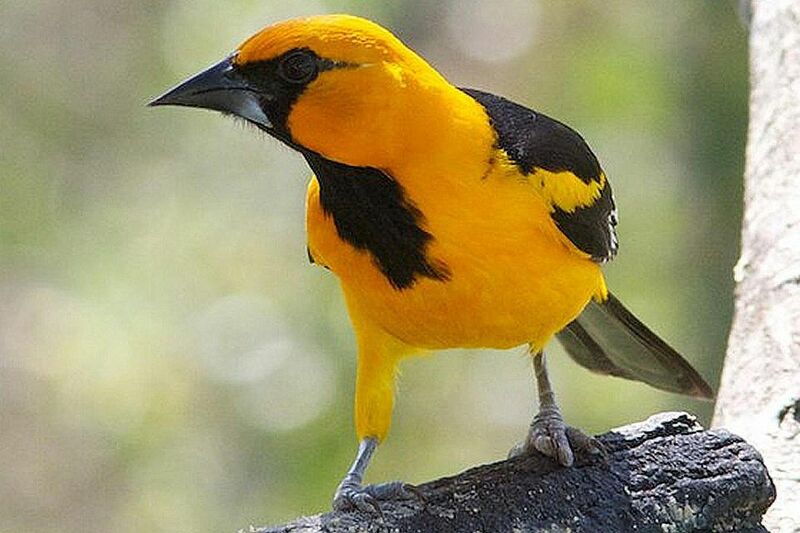 Range: The oriole's range is often its best clue for positive identification. While some oriole ranges do overlap, many of them are quite distinct and can be used with just one or two key field marks to identify the exact oriole species. Habitat: Most orioles do inhabit similar habitats, but there can be some differences between their individual preferences. In many areas, the type of habitat can also help separate orioles from other similar songbirds. Voice: Orioles have rich, beautiful voices, but there are differences between species. Birders who enjoy birding by ear should carefully listen to different oriole recordings to learn their characteristic tones. Feeder Visitation: While all orioles have similar feeding preferences, not all of them are equally comfortable at bird feeders. If an oriole is regularly visiting feeders, that can help narrow down which species it may be. Orioles are amazing birds, and despite their similarities, they are more diverse than many birders realize. By learning how to distinguish between oriole species, birders can better appreciate the individual characteristics that make each oriole unique.